In a couple weeks the published form of my PhD dissertation will be released by T&T Clark as part of the Library of New Testament Studies series. Though I finished the dissertation version almost two years ago, it has taken a while (longer than I expected) to navigate the publication process. I’m excited to note that the release date is just a couple weeks away. A brief interview about the book has been posted to T&T Clarks’ blog. I thought I’d share a bit more about it here as well. Fundamentally the book argues that one of the ways the Gospel of Luke portrays Christ as the true God of Israel is through a reappropriation and transformation of fundamental divine metaphors from the OT and Jewish tradition. It’s actually more complex than that, since these same metaphors often conceptualize a deliverer-figure (read: Messiah, though not always called that) as well. And that, in fact, is kind of the point, as I delve into in the final chapter of the book. This study sits at the intersection of three sub-fields of NT scholarship: NT Christology (specifically Lukan), use of Israel’s Scriptures in the NT, and metaphor theory. It argues that the Gospel of Luke employs certain conceptual metaphors reflected in Israel’s Scriptures in a particular way to portray the identity of Jesus as both an agent of salvation and, more provocatively, the one God of Israel. Chapter One presents an overview of prior scholarship on Lukan Christology and positions this study with respect to approach (titles, Religionsgeschichte, narrative, themes/motifs) and outlook (“low,” “high,” both). 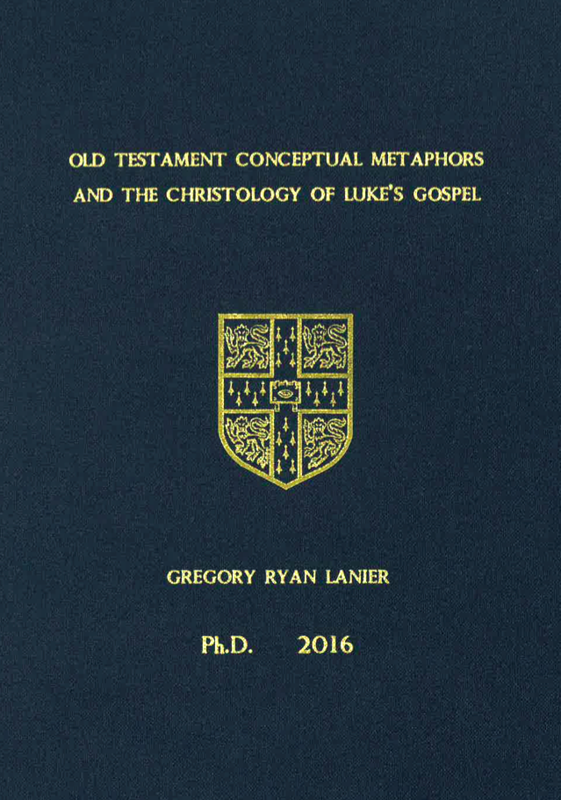 An outline of research on Luke’s christological use of the OT identifies the challenges arising when the typical criteria of biblical “intertextuality” (quotations/allusions/echoes) are strained. The chapter then articulates how conceptual metaphor theory (CMT) might provide a solution in certain cases. Chapters Two–Five follow a consistent outline in analyzing Luke’s appropriation of OT metaphors in four christologically-significant passages: 1:68–69 (“horn”); 1:78–79 (ἀνατολή); 13:34–34 (“mother bird”); 20:17–18 (“stone”). The first section discusses background issues, challenges each metaphor presents on standard intertextual grounds, and prior scholarly interpretations. Section two uses CMT to explore how the source domain of each Lukan metaphor—HORN, DAWN/LIGHT, MOTHER BIRD, STONE—is mapped to various target domains in OT metaphors. Section three exegetes each Lukan passage in context to explore if and how these OT conceptual metaphors are re-mapped to Jesus. Section four assesses the christological implications of such re-mappings. Chapter Six reflects on the broader significance of each chapter’s results. The divine OT metaphors mapping the source domains in question appear to be important ways of conceptualizing the identity of Israel’s God. It is suggested that the re-mapping of such divine metaphors to conceptualize Jesus’ identity within Luke’s Gospel implies a christological outlook best described as “divine identity,” though differing in certain respects from recent scholarship bearing that label. If you follow early Christology, you’ll probably guess that this book was influenced by Larry Hurtado, Richard Bauckham, Martin Hengel, Richard Hays, Simon Gathercole, and others—and you’d be right. However, my goal wasn’t simply to regurgitate what they’ve said but probe an area that hasn’t been explored fully. I always find it helpful when I can take a look at the table of contents of a book before I peruse it further (or buy it, or, as is the case more recently, request it via inter-library loan since our RTS-O librarian is awesome). If you’d like to take a look at the outline in more detail, click here: Table of Contents. In the end, the book is about four brief passages in GLuke! But along the way I try to probe a lot of important questions dealing with how NT authors interact with the OT, how we think about the Godhead, and how the NT portrays Jesus not only as the Messiah, but more than a Messiah. Divine metaphor is one of several ways this happens, as the NT authors grapple with how to articulate ho the person of the Son of God is fully God without collapsing the distinction among the persons (Father, Son, Spirit). This is all part of the broader work I do on studying how the NT documents fully contain in them that which becomes formalized as “Nicene” (and Post-Nicene) trinitarian Christology. What’s Up with the Header Graphic? I’m drawn again and again to this mosaic from the Church of Dominus Flevit outside Jerusalem. It captures (in Latin) the saying of Jesus in Luke 13:34, which, as you’ll observe from above or the TOC, occupied a chapter in the thesis. The “Mother Bird” metaphor, as I unpack it from OT and Jewish sources (and in Luke’s Gospel) is a distinctive divine/YHWH metaphor that Jesus takes on his own lips to effect an important transformation in our understanding of who he is. Read more about it in Chapter 4! Our Cambridge sojourn was a blessing but also a hard road, with family deaths, a miscarriage, and much sacrifice and ups-and-downs along the way. The publication of the book is, in a way, the final milestone at the end of that journey. Through it all my wife deserves immense praise for everything she sacrificed to make the Cambridge adventure possible, and everything that has happened since then. Furthermore, I’d also like to share the full list of personal acknowledgements I included in the dissertation form, which I was not able to put in the T&T Clark version (they have limits on prefaces and whatnot). I’ll let you read it directly: Acknowledgements. I’m thankful for all the family and friends who walked with us on this journey. Previous PostA Note on How We Devised the Vocab Aids for our Septuagint Reader’s EditionNext PostFor Our Septuagint Project, How Did We Handle the So-Called “Double Texts”?